Toyota Sienna Pros and Cons | Page 1 of 4 | Why Not This Car? What drives people to buy (or not buy) a certain car? TrueDelta's members share Toyota Sienna pros and cons based on their real-world driving experiences. Would buy again. Own a 2011 Sienna, Limited, AWD. 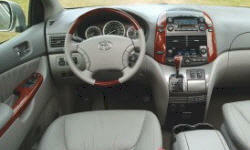 2005 Toyota Sienna: After seven years of ownership, I remain a huge van fan. Good value van to move people from A to B.
I considered the Odyssey and Sienna to replace my 00 Chrysler T&C LTD. I had a better selection of Sienna's, and their reliability is reported to be much better than the Honda. Even if all seats are occupied there is a significant amount of storage behind the back - including the well that the back seats can fold down into. Also, with the back seats down and the middle out there is a lot of storage space with a level "floor". The Sienna had a smooth, willing, powerful, quiet drivetrain. It really looks sharp. However, in the low trim levels Toyota skimped on a cheap grill. Great for hauling mom and dad, two boys, their stuff, great grandma, the dog, and more stuff! From the time I own until now, all I did is put gas and change the oil, coolant/antifreeze, airfilter and transmission fluid. 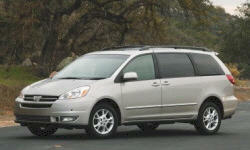 The Sienna is an excellent family vehicle if interior space and overall capability are your priorities. It is comfortable for long family drives and you NEVER run out of space in this car. To get what Town & Country Limited has on the Sienna Limited would cost thousands $$ more. Sienna has tiny backup camera unless you opt for navigation pkg; T&C backup camera is 6" wide. Drives like a Toyota. Better comfort but poorer handling.